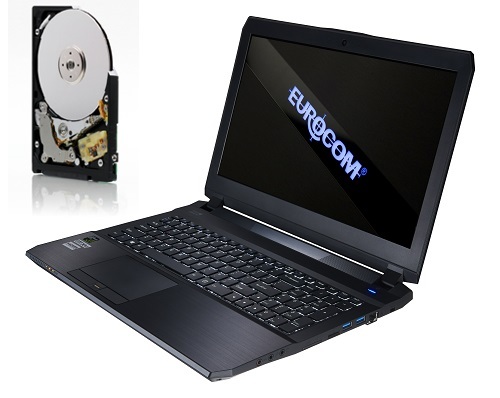 Eurocom is launching the 2.5-inch, 1TB, Travelstar Z5K1000 drive – the industry’s fastest 7.0 mm 5,400 RPM HDD with best-in-class shock robustness in its line of high performance fully upgradeable laptops and Mobile Workstations. Eurocom aims to offer its customers a wealth of options so they can customize their high performance laptops to their exact needs. The Travelstar Z5K1000 1 TB HDD provides customers with a very thin and light storage option to compliment one of the new high performance, ultraportable Eurocom laptops. The Travelstar Z5K1000 1 TB HDD compliments the full line of RAID-able SSDs, HDDs, mSATA drives and M.2 drives already offered in Eurocom systems. Eurocom has expanded the storage capacity and custom options of the entire line of Mobile Workstations and Laptops with the addition of the ultra-thin and fast, 7mm, 1TB Travelstar Z5K1000 HDD. Eurocom laptops are fully upgradeable and custom built, allowing customers to choose the processor, graphics, storage and memory they need to get the job done right and meet there specific computing requirements. Utilizing heavy duty mechanical designs Eurocom laptops are built to last in the most demanding environments. With its 26 percent slimmer z-height compared to traditional 9.5mm 2.-5-inch drives, and weight of only 95 grams Eurocom is able to incorporate the 1 TB Travelstar Z5K1000 HDD into thin and lighter laptops. The 1 TB Travelstar Z5K1000 also offers the industry’s highest operating shock at 400G/2ms and non-operating shock at 1000G/1ms to protect against bumps and rough handling in mobile environments. The 1 TB Travelstar Z5K1000 is the seventh generation self-encrypting drive (SED) to feature HGST’s Bulk Data Encryption. HGST’s hard drive-based encryption is a highly attractive option for any company or individual routinely carrying sensitive information. Based on a unique, compact, two-disk 7.0 mm design, the 1 TB Travelstar Z5K1000 delivers a nearly silent operation at 2.1 idle/2.2 seek bels, perfect for Eurocom customers who require ultra-quiet operation.